This paper looks at the interactivity of Carsten Höller’s Test Site 2006, using Alfred Gell’s Art and Agency (1998) and Nicolas Bourriaud’s Relational Aesthetics (1998). In the first part Gell is used to examine the interactive relationships between artist and participants mediated by the slides, the aesthetic quality and political significance of which are then revealed in the second part with reference to Bourriaud. Undoubtedly the experience of going down the slides is entertaining in itself. To grasp the significance of this work, though, the various interactive relationships that are integral to its very being must be looked at closely. This paper will adopt two distinct theoretical approaches in examining the way Test Site operates interactively and relationally: British social anthropologist Alfred Gell’s theory of agency and French curator Nicolas Bourriaud’s conception of relational aesthetics. The adoption of Bourriaud is, then, an obvious choice for approaching Test Site; Gell’s theory of agency may seem less apposite. Published in the same year as Relational Aesthetics, Gell’s book Art and Agency presents an anthropological theory of art that provides a means of understanding the way art operates in its social context by examining, in his words, ‘the practical mediatory role of the art object in the social process’.7 The essential premise underpinning Art and Agency is that ‘art objects are the equivalent of persons, or more precisely, social agents’, such that they act in particular ways in given social situations.8 In other words, Gell looks at how art objects make things happen. Whereas Bourriaud sought to champion a particular trend in contemporary art, Gell sought to create an approach that, while being universally applicable, would also be especially useful for understanding the way art functions in non-Western cultures. The coincidence of their publications and shared understanding of art rooted in the realm of social interaction underlines, however, the prevailing sense, then as now, of a culminating shift in art praxis and theory away from the autonomy of the art object, to its contingency on the people who engage with it. Although the respective theories of Gell and Bourriaud are markedly different in terms of their aims and scope, both are predicated on the fact that art operates in terms of human relations. Indeed, from this shared foundation, there are certain striking similarities between the two texts. For example, both authors use the analogy of ‘reading’ facial expressions to describe how works of art communicate: Bourriaud quotes the critic Serge Daney in stating that ‘all form is a face looking at us’, while Gell says that we approach art objects ‘as if they had “physiognomies” like people’.9 Speaking in such terms, both authors emphasise the fundamentally interpersonal means by which art functions. The theories of both Gell and Bourriaud offer valuable insight into the way Test Site operates in a field of human interaction. Taken in isolation, either of these conceptual frameworks would produce a partial insight into the relational aspects of Test Site; in adopting the relevant aspects of both, a rounded insight can be achieved. In particular, Art and Agency provides a means of fragmenting Test Site into its different constituent relationships and considering their complex and changing power balance in terms of Gell’s ‘agent’ and ‘patient’ dichotomy. Conversely, Bourriaud’s ideas are useful in understanding the formal qualities of Test Site and its political aspect as a prototype that proposes change for our urban environment. The first part of this essay will adopt the ideas of Gell to reveal the ways in which the slides of Test Site act as agents that mediate relationships between Höller and its visitors. The second part will use Bourriaud to extrapolate what these relationships mean in terms of art and thereby reveal the aesthetic and conceptual depth of this deceptively simple work. Works of art never exist independently or discretely. An art object always constitutes the nexus between its maker(s) and those that receive it; in Gell’s terms, between the artist and recipient.10 As Höller says, ‘I don’t believe in the art object as such […] I don’t believe it works on its own’11 Like Höller, Gell believed that the art object has no ‘“intrinsic” nature independent of its relational context’.12 Rather than treat works of art as a means of communication between artists and recipients through symbolically encoded signs, Gell focused on what the art object does rather than what it says: ‘I view art as a system of action, intended to change the world rather than encode symbolic propositions about it’.13 Few works of art are as congruent with this approach as Test Site, for few works of art are so clearly and emphatically oriented to action. The slides of Test Site exist as intermediaries between Höller as the artist and the art-going public of Tate Modern, acting on behalf of Höller as social agents, defined by Gell by the fact that they cause ‘events to happen’.14 At first this process of action seems unequivocally one-directional: the artist affects the recipient via the art object. This is the paradigmatic relationship in art according to Gell’s system. The artist acts as an agent to create the work of art; the work of art conveys the agency of the artist to the recipient; the recipient is a ‘patient’ of the artist’s agency carried by the work.15 In the present case, this tripartite process can be expressed thus: Höller causes people to slide by the presence of the slides he installed in the gallery. In reality though, it is not so simple. For a start, the recipients of Test Site have a choice whether or not to slide. Indeed, Höller was keen to stress the validity of experiencing the work without doing so; as he says, it ‘is a misconception to think you’re obliged to join in sliding’.16 Works of art subject people by their mere presence; one cannot feasibly choose not to look at, or hear, a work of art upon entering its space, for by the time it is apprehended, its agency has already acted upon the recipient (in choosing to turn away at this point the recipient only reinforces the agency of the work). The same is true to that extent with Test Site, so far as it can be experienced from without. Unlike most works of art, however, it poses the subject with the option of a further and altogether different experience; an experience upon which the work is entirely dependent: that of sliding. This choice imbues the recipient with an agency of their own and complicates the relationship described above. It can be amended thus: Höller affects people to slide via the slides but only if they choose. In a text used by Höller as source material, the writer Roger Caillois identifies the freedom to accept or refuse as characteristic of the games he associates with the sensation of vertigo.17 For the recipient, being able to choose is crucial in forming the overall dynamic of Test Site; it forms one of the bases of the interactivity between artist and recipient mediated by the object, which bears the analogy of a game taking place between the two. To consider Test Site only in terms of the experience of sliding is a mistake. From first being faced with the work, the recipient makes a choice whether or not to slide and in doing so is in a position of agency; this is maintained until ‘the point of no return’ (fig.2) where the slide is entered and agency is abruptly switched, the recipient being wholly a patient in respect of the slide for the duration of the ride. Gell’s anthropological theory of art is useful in understanding the interplay of agency between Höller and the beholder’s of Test Site through the operation of the slides and how this sets up the dynamic of the work. It is also useful in demonstrating how the subject becomes one with the object of the work through the performance of sliding. Agency, Gell notes, may be physical, political and aesthetic.25 Test Site combines all of these. Where Gell’s theory stops short of approaching Test Site is in offering a means to understand its significance as a work of art, especially in terms of these latter two. Gell provides insight into the nature of the complex co-active relationships that pivot on the art object but does not provide a way to extrapolate what these relationships mean. Conversely, Bourriaud’s ideas in Relational Aesthetics offer a way into these issues. Whereas Gell, as an anthropologist, deliberately rejects aesthetics in his theory because of its problematic cultural relativism, Bourriaud, as an art critic and curator, seeks to base his appraisal of the social interactivity of art in exactly this realm. Indeed, Bourriaud states that ‘Relational aesthetics does not represent a theory of art […] but a theory of form’.26 Moreover, he is interested in the way that relational art can operate socio-politically in terms of offering positive alternative models of social interaction as ‘hands-on-utopias’ providing ‘values that can be transposed into society’.27 The breakdown of the relationships that are mediated via the slides of Test Site using Gell has provided the groundwork for their aesthetic and political significance to be examined presently using Bourriaud’s ideas. It may be counterintuitive to think of aesthetic form residing in something as apparently open-ended and indeterminate as social interaction. Addressing this issue, Bourriaud defensively comments on the ‘instability and the diversity of the concept of “form”’, as a way to allow for the elusive and transitory nature of such interaction.32 He also provides more concrete and positive means of understanding how interaction can be understood on a formal level. Form is defined in Relational Aesthetics both as ‘a coherent unit’ and a structure that ‘shows the typical features of a world’.33 In these terms, it is the sense in which Test Site exists as a singular totality, containing within itself divergent relations, that it achieves the unity and coherence by which Bourriaud defines form. Analogous to the way that formal elements in a painting operate relationally within the totality of the frame, the participants of Test Site operate relationally within the totality of its environ. Thus, to approach the relational aesthetics of Test Site, the entirety of the human interactions that define it are to be understood as a coherent ‘world’ of form. ‘World’ is especially potent in encompassing the idea of a diversity of subjects intersecting within a definable sphere or domain.34 In order to maintain the possibility of works of art existing as aesthetic ‘entities’, Bourriaud redefines the boundary of a work of art from a material limit to the limit of the inter-subjective activity that takes place in its space and time, what he calls ‘relational space-time elements’.35 As the artist, Höller’s relationship to these forms is not so much one of creator as facilitator: he sets up the condition for their manifestation in real time. In accord with Höller’s scientific background, Test Site is set up like a social experiment, which by definition has no predetermined outcome; indeed, the title of the work refers to this. Through placement in a gallery context, a significant aspect of this experiment is to prompt participants to self-examine their experience of interaction as an aesthetic one. Unlike Gell, Bourriaud focuses on how works of art prompt recipients in their vicinity to interact with each other and how this can be integral, if not paramount, to the work. Such activity operates both aesthetically, as indicated above, and politically. Such a ‘micro-community’ of participants, brought together by Test Site, is most evident where people anxiously and excitedly line up to go down slides and where they congregate with child-like intoxication at the ejection points.36 This idea of bringing people together to interact with one another is one of the bases for the political project that Bourriaud identifies in relational art. He adopts the Marxist use of the term ‘interstice’ to describe the possibility offered by such works for personal exchanges that circumvent the increasingly inescapable framework of the capitalist economy, which conditions so many aspects of living. Although Tate Modern is just as much bound by economic conditions as any other institution, the interactive experience offered to visitors of Test Site provides an alternative to relational spheres which are structured by monetary exchange, such as the café and restaurant in the gallery. Even though Test Site does activate a ‘micro-community’ of participants in its vicinity, this is not the foremost way that it functions on a political level. 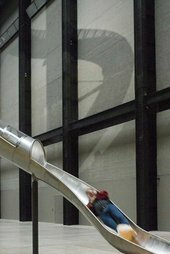 It is the subject’s private interaction with the slide, and therefore Höller’s agency mediated by the slide, that constitutes the primary relationship of Test Site. Through this relationship, Test Site provides a model or prototype for change in our urban environment. It presents the possibility of an exuberant and joyful experience in the negotiation of something as simple and ubiquitous as the necessity of getting down from an upper floor of a building. ‘Art does not transcend day to day preoccupations’ says Bourriaud, ‘it brings us face to face with reality though the singularity of a relationship with the world’.37 One reality that Test Site ‘brings us face to face with’ is the level of control exerted over our day-to-day lives through the physical structures which mediate our activity: the way that towns, cities and buildings are organised to maintain obedience and subservience on the part of their inhabitants. What is at stake here is not the practical efficiency of urbanised environments but the insidious exertion through them of psychical and ideological control. As the French philosopher Michel de Certeau states, ‘Spatial practices in fact secretly structure the determining conditions of social life’.38 Social life is thus affected to serve the interests of those who structure it, namely the corporation and the state. It is on this basis that Bourriaud applauds the social ‘interstices’ that he identifies taking place in the gallery as a way of counteracting the self-serving, mechanised capitalist frameworks of interaction that dominate society. In her essay ‘Turbine Höller’, the curator of Test Site Jessica Morgan emphasises the significance of the work as a proposal. She asserts the transformative effect on one’s behaviour offered by sliding that will ‘subtly alter our outlook’ and ‘provide an altered perspective’ through the exhilarating and joyful experience it offers.41 Morgan tells us that it is Höller’s conjecture that this transformative effect will be heightened if sliding is administered in regular doses. Ever the scientist, this is Höller’s proposed daily prescription for our well being. Ironically, though, it is exactly through such regularity that the transformative potential of this experience may be lost. As a prototype for widespread instalment into the urban fabric, is Test Site doomed before it has even left the post? What is extraordinary soon becomes passé with overexposure. If Test Site were to be adopted as a practical model for urban design, then the playfully anarchic spirit of the experience it offers may be lost or subsumed within the corporate apparatus and neutralised through repetition. On this basis, it is questionable whether anyone seriously intended Test Site to be, what Morgan calls, ‘a modest beginning for the wide-scale transformation of behaviour’, or whether this merely provided a convenient fiction to imbue the work with added weight and meaning.42 Several years on, there is no sign of Höller’s model catching on. In this vein the art historian Claire Bishop presents a relevant critique of Bourriaud’s relational art, stating that it ‘gives up on the idea of transformation in public culture and reduces its scope to the pleasures of a private group of individuals who identify with one another as gallery-goers’.43 By showing that ‘microtopias’ such as Test Site are based around the inherently undemocratic exclusivity of a group, Bishop questions their political value as a model of interaction. One of the predecessors of Test Site, installed in the office of fashion designer Miuccia Prada, which, for her sole reserve, transports her to her car, keenly demonstrates how such models can fall foul of hierarchical division. Using the theoretical frameworks of Gell and Bourriaud respectively has shown how interactivity is at the core of Test Site. In particular, applying Gell’s theories has been instrumental in showing the different ways that the recipients of the work are involved as agents in its formation: not passively like an audience but actively as co-creators. By doing so, Test Site can be understood as a kind of game taking place between Höller and its visitors; it is a structured interplay between two sides. The aesthetic and political aspects of Test Site are not something separate from its interactive ‘space-time elements’ but precisely located therein. Bourriaud provides the way to understand how the interpersonal relations of Test Site are aesthetic in nature, existing together as a total ‘world’ of form. Moreover, Bourriaud shows how political significance is inscribed in these relational elements, both literally and symbolically. By using Gell’s categorical system it is apparent that Test Site displaces the canonical relational structure of art in various ways that activate the recipient. In doing so, Höller redresses the usual power imbalance in that structure in a way that is inherently democratic and egalitarian. Test Site does not call for the ‘death of the author’ and the ‘birth of the reader’, as the French philosopher Roland Barthes famously did.47 Authors and readers are both very much alive in this work, but, crucially, neither artist nor recipient is fixed to any such position. The ‘beauty’ of Test Site comes from the fluidity through which the artist, and especially the participant, moves from being ‘author’ to ‘reader’ (or agent to patient) and vice versa, or both at once. Test Site lives through collaboration. It is the dynamism of the work, much like the world in which we live, being continually born and reborn, that distinguishes the art of interaction. 1. Mark Rappolt, ‘My Idea of Fun’, Art Review, no.4, October 2006, p.50. 2. Mikhail Bakhtin, Rabelais and His World, Bloomington 1984, p.10. 4. Daniel Birnbaum, ‘Mortal Coils: Daniel Birnbaum on Carsten Höller’, Artforum International, vol.45, no.5, January 2007, p.76. 5. Nicolas Bourriaud, Relational Aesthetics, Dijon 1998, p.113. 7. Alfred Gell, Art and Agency, Oxford 1998, p.6. 9. Bourriaud 1998, p.21; Gell 1998, p.15. 16. 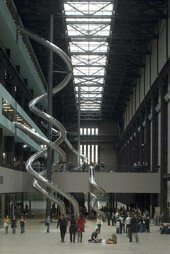 Karen Wright, ‘Down the Chute at Tate Modern: Carsten Höller’s London Tubes’, Modern Painters, October 2006, p.86. 17. Roger Caillois, ‘Man, Play and Games’, in Carsten Höller (ed. ), Carsten Höller Test Site Source Book, London 2006, p.80. 18. John Dewey, ‘Art as Experience’, in David Cooper (ed. ), Aesthetics the Classic Readings, Oxford 1997, p.221. 22. Robert Layton, ‘Art and Agency, A Reassessment’, Journal of the Royal Anthropological Institute, no.9, 2003, p.454. 24. Dorothea von Hantelmann, ‘I’, in Jessica Morgan (ed. ), Carsten Höller Test Site, London 2006, p.30. 28. Michael Fried, Art and Objecthood, Chicago and London 1998, p.153. 34. ‘World’ is not intended here as a specific reference to the 2009 Venice Biennial ‘Making Worlds’ curated by Daniel Birnbaum. 38. Michel de Certeau, The Practice of Everyday Life, Berkeley and London 1988, p.96. 40. General Public Agency, ‘Slides in the Public Realm, A Feasibility Study for London’, in Höller 2006, pp.57–89; Bourriaud 1998, p.46. 41. Jessica Morgan, ‘Turbine Höller’, in Morgan 2006, p.14. 43. Claire Bishop, ‘Relational Aesthetics and Antagonism’, October, vol.110, Autumn 2004, p.69. 44. James Collard, ‘Carsten Höller: from Conrad to the Heart of the Disco’, Times, 18 November 2008; http://entertainment.timesonline.co.uk/tol/arts_and_entertainment/visual... accessed on 29 March 2010. 47. Roland Barthes, ‘The Death of the Author’, Image, Music, Text, London 1977, pp.142–9. Mark Windsor is a postgraduate student at the University of Sussex. 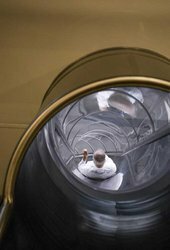 Mark Windsor, ‘Art of Interaction: A Theoretical Examination of Carsten Höller’s Test Site’, in Tate Papers, no.15, Spring 2011, https://www.tate.org.uk/research/publications/tate-papers/15/art-of-interaction-a-theoretical-examination-of-carsten-holler-test-site, accessed 23 April 2019.